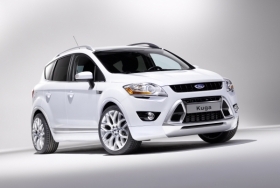 The addition of the Kuga, a C-segment or compact vehicle, is part of Ford's plans to introduce 15 models in China by 2015. Pictured is the European version of the vehicle. SHANGHAI -- Ford Motor Co. said it will make the next generation of its Kuga compact SUV in China and boost marketing spending to help win sales in the world's largest auto market. "We have to make sure our advertising spend is high enough as a percentage of our revenue," Jim Farley, the company's group vice president for global marketing, sales and service, said today at the Shanghai auto show. He didn't elaborate on how much the company planned to spend. The addition of the Kuga, a C-segment or compact vehicle currently made only in Saarlouis, Germany, is part of Ford's plans to introduce 15 models in China by 2015. The company also intends to double its number of dealerships to 680 to help challenge market leaders General Motors Co. and Volkswagen AG. "To be a volume player in China, you have to execute the C-segment flawlessly," Farley said. The automaker didn't say when China production of the Kuga may start. Ford, which sells the Focus compact and Fiesta subcompact in China, has a market share of 2.4 percent, according to industry researcher J.D. Power & Associates. The automaker expects China's car market to grow as much as 10 percent this year, with its own sales outpacing the industry. Last year, Ford's China deliveries rose 40 percent to 582,467, surpassing the 32 percent industry average. The company is banking on emerging markets to help it maintain profits after posting $6.56 billion in net income last year, the most since 1999. It is building a new vehicle plant through its China venture in Chongqing and it has plans for a new engine plant in the southwestern city.